Luna Optics describe their LN-SX3 night vision monocular as great value with a compact, lightweight and water-resistant design that also features a high quality optical system. With this in mind I really looked forward to reviewing it, not only for this site, but because as I write this, I am also busy planning for my next trip to Southern Africa and am on the lookout for a new night vision binocular or monocular for myself. For me, a night vision device is now almost essential on safari because after the famous African sunsets disappears and the stars come out, so much of the African bush comes alive and being able to see in the dark gives you a view into a whole new world. I tend to take quite a bit of equipment with me when I go on safari, this obviously includes a good pair of safari binoculars, a camera with a telephoto lens, a tripod, as well as some sort of night vision device. This means that everything has to be as lightweight and compact as possible and that is one of the main reasons why a monocular is in some ways more appealing to me than a larger night vision binocular. The actial weight of the Luna Optics LN-SX3 night vision monoculars is only 450g (0.99lb) which makes them only a little heavier than most compact binoculars and lighter than most mid-sized binoculars. Considering that these have a pretty large 50mm objective lens, that is impressive. They are also far lighter than most night vision binoculars that I have used and so carrying them with you all night will be no problem. I also really like the "video recorder" type side strap that makes them not only very comfortable to hold in one hand, but the controls are easily accessible with the same hand that you are using to hold the device with. Their dimensions are fairly compact as well: 175mm x 58mm x 75mm (6.8" x 2.2" x 2.9") and you should easily be able to pack them away in your hand luggage for traveling with as well as in your day/night pack. On top of the body and easily reachable whilst you are holding the monoculars up to your eyes is the On/Off and Infrared illuminator (IR) buttons. Just above the eyepiece is the battery compartment, accessed with a twist off cap that takes 1x3V Lithium (CR123) battery that Luna Optics say gives you an operating time of 36 hours. Above that are the two light indicators that let you know when the device and if IR illuminator is turned on. 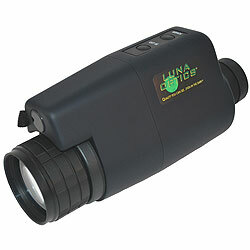 These Luna monoculars come with a built-in IR illuminator (Infrared illuminator). What this does is enable you to use them whenever there is not enough ambient light to see clearly even even in complete darkness. It is turned on via a button on top of the body and emits and infrared light, which shines onto the object you are viewing and then reflects back to the LN-SX3 and is then amplified by the tube in the same way as ambient light is. A point to mention is that these Luna night vision monoculars are weather resistant and are not fully water or fogproof - something that you may consider if you need a device for full wet weather night surveillance. The eyecup on the LN-SX3 is made from a fairly soft rubber and fits comfortably even when pressed firmly against your face. To focus these Luna Optic monoculars, you just twisting the ends of the barrel. To go from near focus to infinity only takes about half a turn, which makes focusing pretty quick. 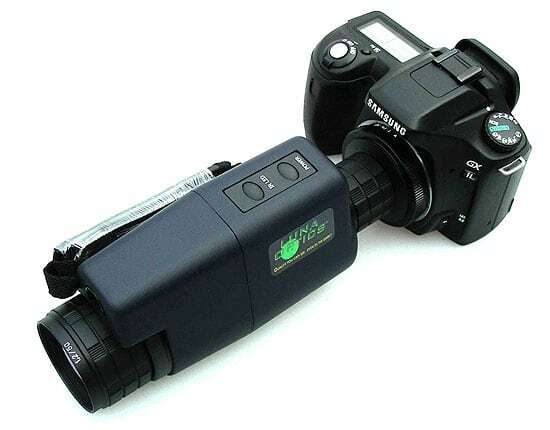 The eyepiece (ocular lens) can also be adjusted by turning it and it plays an important part in setting up these night vision monoculars to suit your eyesight. In general, the larger the objective lens, the more light gathering potential of your optics. The down side to large objective lenses are cost and the fact that they will make your device bigger and heavier. I think with 50mm objective lenses, these Luna night vision binoculars have got the equation about right with more light gathering potential than many other monoculars on the market, yet they are still small and light enough to easily carry around with you and pack away in your luggage. Unfortunately, I could not find out any information regarding lens coatings on the LN-SX3 apart from the fact that they are multicoated, which means that at least some air to glass surfaces (usually the first and the last) have multiple layers of antireflection coatings that help to transmit as much light as possible. Many people may wonder why you can't find night vision monoculars with more powerful magnifications like what you find on standard day monoculars (8x or even 10x) and if a 3x magnification will be powerful enough for them. The reason the magnification on night vision devices is usually much lower than of the daylight binoculars or monoculars is because to make higher magnifications, the objective lens elements need to be thicker. This thicker glass means that they will transmit less light than thinner lenses. As every little bit of light transmitted is so important during the night, to make night vision viable, the magnifications have to be lower, usually under 7x, this preserves the best possible balance between image magnification and the light transmission. What is a little confusing is that not all Gen 1 devices are created equal and you can find quite a large difference in performance. This is because during the manufacturing process all tubes are evaluated and graded according to their quality and performance and are sold at significantly different prices depending on their light amplification and image clarity. This of course is reflected in the final price of the Night Vision device. Luna Optics point out that they are proud of the fact that they only buy the top grades of the intensifier tubes, and so even though some of their models may be a little more expensive than other Gen1 devices of their competitors, you can be sure that you are getting the best quality possible. Additionally, as a part of their quality control, every Luna Optics device is inspected twice: once at the factory level and once again at their US warehouse prior to shipment. So what does the view look like through them at night - well looking at the back of my garden which is 120ft away, I could easily make out my vegetable beds and the onions that I had planted late last year. The brightness and contrast were pretty good and there were far less black dots in the view compared to what I have seen in other night vision devices, which considering that these are entry level night vision monoculars really impressed me. I also compared the view through these with the Luna Optics LN-PB3 night vision binoculars and the Luna Optics SM50 Night Vision Monoculars that I also had with me. The image produced by all three was fairly similar in terms of brightness and overall quality, with the binoculars just edging it. Which when you consider the large price difference and the fact that the binocular has effectively double the light gatthering ability this is very impressive. The image brightness between the SM50 and these were close and it will just depend on if you would rather have a more compact, lghter device, or a larger heavier one with a more powerful magnification. The built in IR illuminator also works really well and really brightens the view at close to medium distances. It will also enable you to use these monoculars in complete darkness! Whatever available light there is (ambient light from stars, the moon and man made lights etc) reflects from the viewed object, passes through the objective lens of the LN-SX3 night vision monoculars and creates an image of that object on a photo cathode screen, which is located on the front of an Electronic Intensifier Tube inside them. These night vision monoculars have, for an entry level device, a good viewing distance of 200 meters (650ft) which compares very well with other monoculars in this price range (see table below). To increase the magnification of a device, you need to have thicker glass, this means that less light gets transmitted to the photo cathode screen, meaning that the image will be less bright. Larger objective lenses may let in more light, but are costly and obviously make your monoculars bigger and heavier. So overall, I feel that the 3x50mm combination is a pretty good compromise between the size of the monocular and it's light gathering potential and the brightness of the image. The field of view for the Luna Optics SX3 is a good 213m at 1000m / 638ft @ 1000 yards (12°) which again compares very well with other night vision monocular in their class on the market. The minimum close focusing distance is 3m (9.8ft), which is a little further than the very best out there and therefore makes them less suitable if you want to view objects up close at night. I thought it would be interesting as well as informative to compare the stats of the Luna LN-SX3 and LN-SM50 night vision monoculars, the Luna LN-PB3 binoculars and another popular entry level device, the Bushnell 2.5x42 Night Vision Monoculars. These Luna night vision monoculars come with a good quality soft carry case and a metal lens cap that screws onto the end of the objective lenses and therefore will definitely not fall off accidentally. They have small pin hole in them so you can look through the monoculars during the day. You can easily attach you SLR camera to the LN-SX3 monocular using the Luna Optics LN-CAS camera adapter and the a 'T' mount adapter for your particular SLR camera. This effectively converts the monocular into a night vision lens for your camera. To mount it, all you have to do is remove the eyepiece on the LN-SX3 and screw in the LN-CAS adapter. This then attaches to your 'T' mount adapter and then onto your camera. Unfortunately for my review I was not able to test the results (I don't own an SLR) but it sounds really exciting and in theory will open up a whole new nocturnal world for your photography, be that for wildlife photography or even for security and surveillance. Considering its very low price point (for night vision gear), I must say that I am hugely impressed with the Luna Optics LN-SX3 night vision monocular. Whilst the image it produces is not quite a bright as the LN-PB3 Night Vision Binoculars, the difference is not all that much and these are far smaller, lighter and cheaper. The built in IR illuminator works really well and I really like the video recorder type strap that makes it very comfortable and secure to hold in your hand. Weak points? Considering the price, it is hard to be too critical, but like most other Gen 1 night vision devices you do get a small high pitched whine whilst it is turned on, which if you are looking at very sensitive wildlife may disturb them. 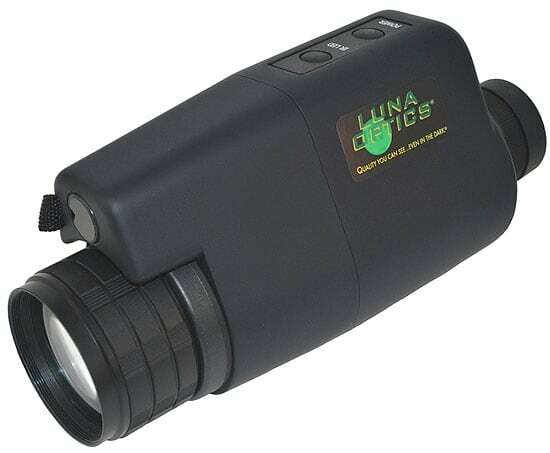 But overall if you are looking for an in-expensive, but good quality and compact entry level night vision monocular that will work well for home security, camping trips and night time wildlife observation, then I recommend the Luna Optics LN-SX3. Their compact size also makes them ideal for taking with you on safari. I personally have decided to go on safari with the LN-PB3 Night Vision Binoculars for myself, even though they are more expensive, larger and heavier. I just prefer the way a binocular feels against your face and what really swung it for me was when I added the LN-ELIR-1 laser illuminator to the binoculars - it is a rather expensive accessory, but it does make a big difference. Without the extra laser illuminator, the decision would have been very difficult indeed. I would like to thank Opticalia Ltd, the UK distributors of Luna Optics, for providing me with the sample to review.